Sissoo (Indian Ironwood) trees are listed as one of the most invasive trees of the world due to its root structure which can reach great distances from the trunk of the tree. 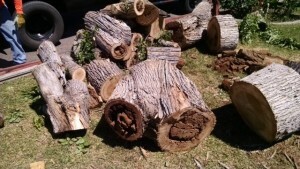 Our customers have found roots and shoots sprouting from them up to 100′ away from the trunk. One customer had them coming up through the kitchen island around the drain pipe from the sink causing damage to the plumbing. 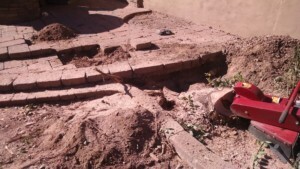 Gravely’s Septic Service has found Sissoo tree roots inside of septic tanks and the drain pipe leading to the septic tank. A quick call to Gravely’s by several customers confirmed that this tree should not be anywhere near a septic system due to the fact that the roots are so very aggressive and will cause $1000’s in damage to your septic system. So why is this? The aggressive Sissoo Tree root structure is key to the plant’s survival and propagation in its native environment where it needed to establish a strong root system to survive in its native soil. Consequently, this tree is an excellent choice where soil erosion is a concern. For example, in the Phoenix freeway system where the road system is built below ground level, these trees have been planted to help secure the soil from eroding from the valleys heavy rain storms. These are nice and shady trees if they are placed far enough away from any underground utilities or structures. 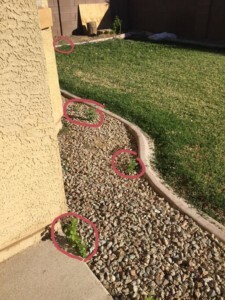 This Queen Creek Arizona Cortina community customer called their Sissoo trees, evil devil trees, like poltergeist because of the roots continuing to sprout new tree plants all over the yard after the trees were removed. We solved this problem and permanently eliminated the possibility of the tree coming back. 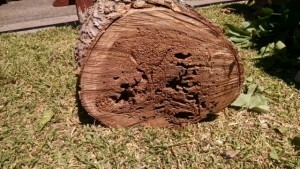 We use a special procedure to permanently remove the tree and the chance of the roots sprouting new trees. 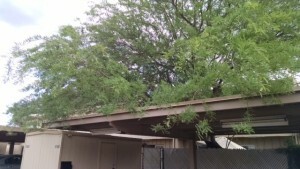 This Queen Creek Arizona Cortina community customer had us remove his very large and quite beautiful Sissoo tree as its roots were intertwined with the lawn and continually damaging the irrigation system, requiring costly repairs. 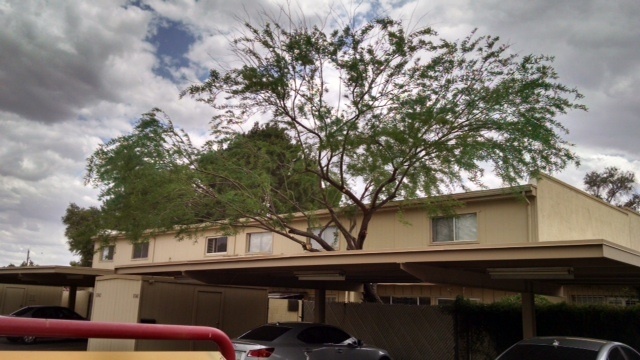 This Queen Creek Arizona Cortina community customer had us remove 7 large Sissoo trees, as they were causing damage in several areas of the property. 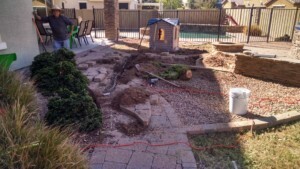 We had to remove dozens of pavers to remove the roots that were lifting the pavers and causing a dangerous trip hazard. 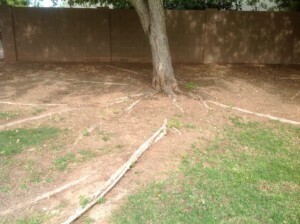 One of the roots was 60′ away from the tree and working its way towards the pool. They have been known to penetrate the walls of the pool to get the water. Also, note the damage this root was doing to the grass border. There are exceptions to this opinion. 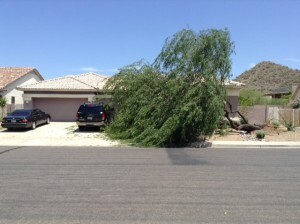 Yesterday’s winds caused some damage to a lot of the valleys trees. 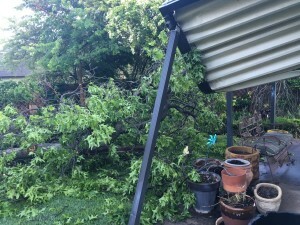 Branches were downed or broken and hanging. Trees that are not properly maintained by a tree expert can pose a hazard in these windy conditions with falling branches and in extreme condition falling trees, both can pose a serious risk. Your trees need to be protected from adverse weather conditions as they are a important part of your property which can enhance your properties value. Wow what a windy day today, the trees and palm trees were swaying in the wind. This is mothers natures way of trimming trees. 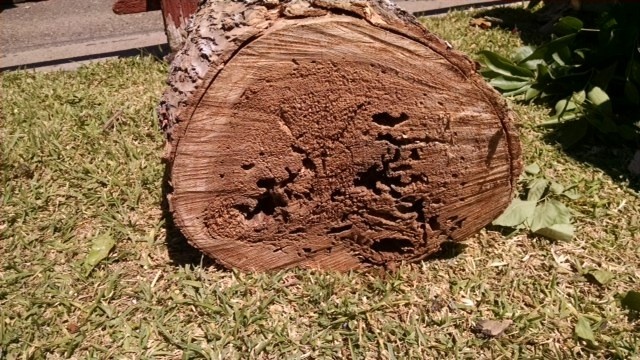 It’s time to think about thinning out your trees before the monsoons come in and do it for you. Eucalyptus trees are susceptible to wind damage, now is the time to have us come out and evaluate your trees and make sure they are ready for this years monsoon season. Well plenty of tree pruning or trimming this week. We worked on some Ficus, Ash and Mulberry trees this week that have been trimmed or topped previously by non PROFFESIONAL tree workers that were promoting themselves as experts. 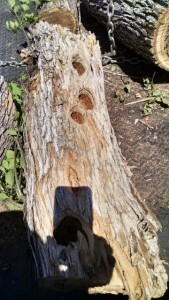 There are ISA and ASTM standards for proper pruning techniques and clearly this not performed on these trees from the previous workers. Please if you are considering tree trimming it is imperative to your trees health to choose someone who understands how a tree should be pruned properly to promote its health.